It was a very sleepy morning as Gaytri, Muratti, Andy and me arrived at Marina South Pier for the trip to St. John's Island. We were just about to depart when Ria saw James coming in and shouted for him to hurry up and he ran down and boarded the boat just in time. The morning was spectacular with a pink sunrise coming from behind us. 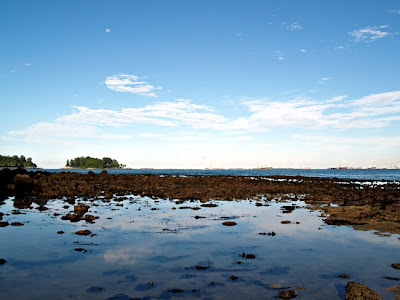 Sisters Islands were in the distance and so as was Sentosa. 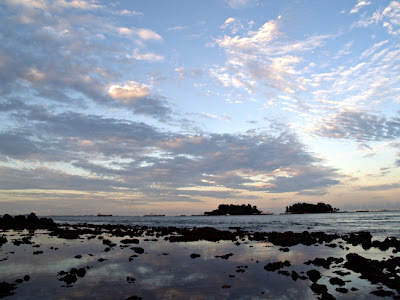 Very quickly, the sky turned a pleasant blue which was reflected off the crystal clear waters at SJ. 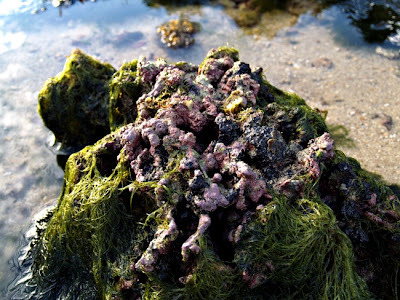 The shores were littered with corals and rubble with a small patch of seagrass where the sediment was a bit muddy. In the pitch darkness of the early morning and under the guidance of Gaytri's torch, I spotted this conspicuous flatworm Pseudobiceros bedfordi lying on some rocks. 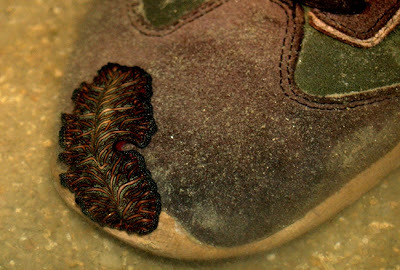 As Andy and Muratti was filming and taking pictures, this bugger decided it would take a swim to Muratti's shoes! Following the flatworm find, Andy spotted a really tiny Copperband butterflyfish Chelmon rostratus swimming in a small pool of water. These guys are often collected from the wild for the aquarium trade and sadly, many hobbyists do not realise that these fishes eat coral tissue and end up "humanely euthanising" them when they start pecking on their precious coral displays. As we were walking along the shore, Ria suddenly let out a thunderous announcement "Crinoid!!". Everybody went over and there laid a blackish green featherstar on a piece of rock. 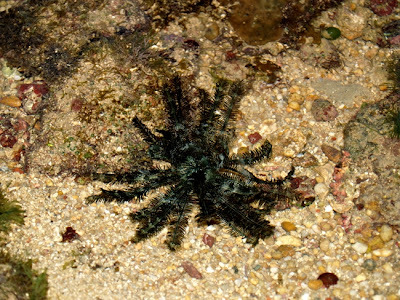 According to Ria, featherstars are not commonly found on the shores and this one probably got washed up. 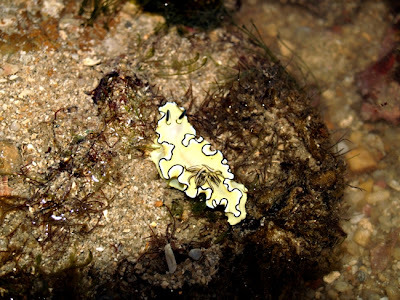 We also found a nudibranch Glossodoris atromarginata not far from the featherstar! 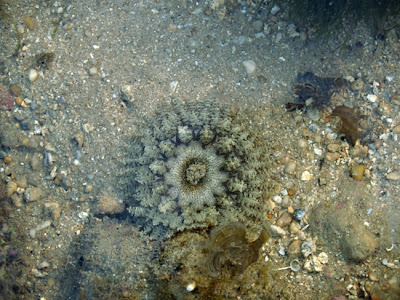 One thing I noticed about St. John's is the abundance of large rock anemones compared to the many carpet anemones found at the other sites. I also managed to find another flatworm which was black and had an orange ring on its "skirt". 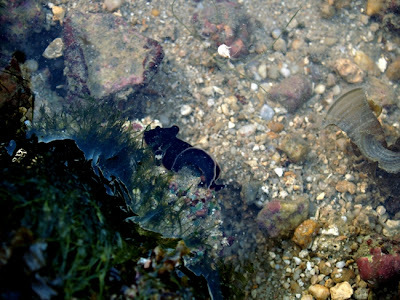 I really love to see the flatworms swim as it is a truely amazing sight. 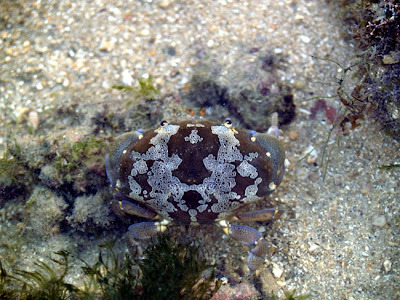 This great looking crab was very shy and didn't want to be photographed. I had to stand really really still and tolerate all the sandflies to get this shot of its beautiful shell. On the rocks I noticed quite an extensive encrustation of coralline algae. 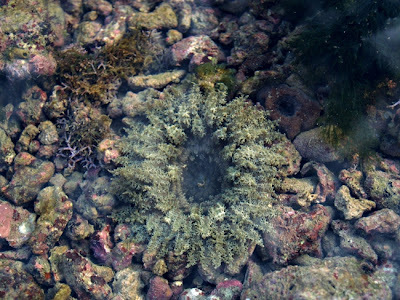 This might show that St. John's has the potential to develop as a reef that is abundant with life. 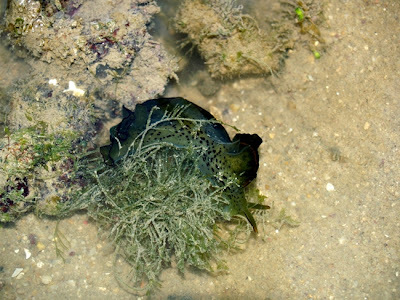 As we were walking back in the direction of the hut where we put our barang barang, James found this green nudibranch which had black spots on its underside. 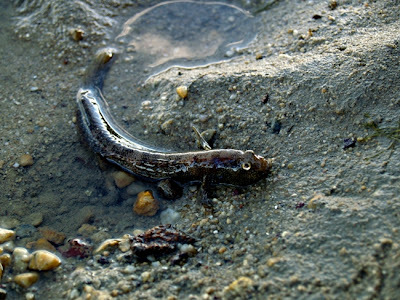 A few steps ahead, we spotted this goby that was out of water. James used his big hands to scoop the fish into a pool of water nearby. 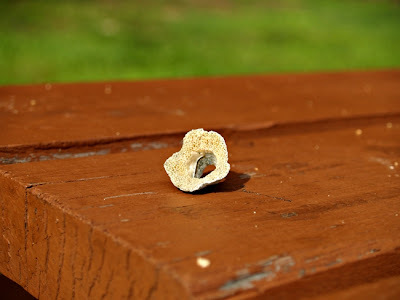 Ria went to find the fiddler crabs and brought back this remains of a volcano barnacle. Inside the little "mountain" that we normally see are little pores that serve to keep the creature cool. Talk about living in comfort!! Other than Gaytri who didn't bring along a camera, the rest of us were shooting in DSLR glory. I managed to get this shot of our cameras when we were eating breakfast after the long morning. 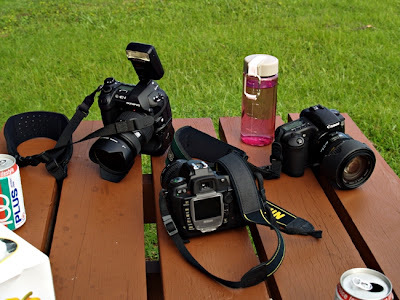 From the left is Andy's Olympus E1, Muratti's Nikon D70 and James's Canon 20D. Ria has her two very famous cameras that seldom leaves her neck (which explains why they are not in the picture haha). 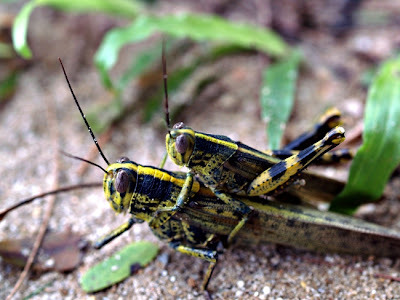 On our way back, we spotted a pair of mating grasshoppers and Andy was really kind to lend me his 50mm macro lens to get a shot. It was a long morning but all so worth it! 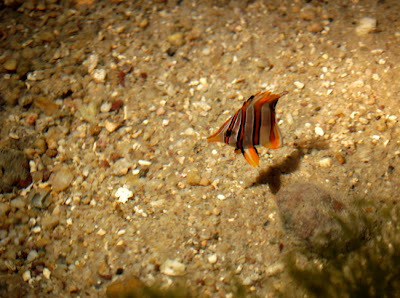 Nice photos :) Till now I still have problem getting a good shot of a butterflyfish. Always wrong angle. Thanks a lot for the clarification on the green slug Ron. Somehow I still can't differentiate the 2 (always forgot to look for the gills). You got to really teach me about these interesting creatures man! Nice pix. How I wish I can be there too.